Handcrafted Tooled Leather Decorative Box, "Lope de Vega"
The epoch of Spanish playwright Félix Lope de Vega (1562-1635) inspires this beautiful chest by the Rios family. Covered with lavish motifs in tooled leather, the smooth rectangle is handcrafted of moena wood. A velvet lining protects jewelry or keepsakes. 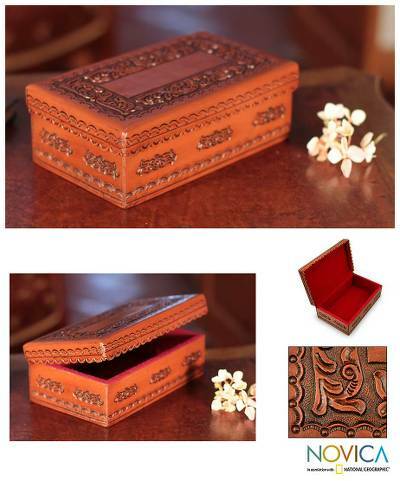 You can find tooled leather box 'Lope de Vega' by Rios Family in decor accessories categories such as Leather Decorative Boxes and Wood Decorative Boxes. Enjoy exploring these sections for other Novica treasures. Rios Family has received 9 microcredit loans with 0% interest from Kiva and Novica, the first for $600 and the most recent for $2850. Proceeds were used to invest in the purchase of quality leather and wood to increase production. I love this well crafted leather box. I used my ""Birthday Credit"" to go towards the purchase of this jewelry box for my son's girlfriend. The details are amazing. Excellent quality- superb craftsmanship. I recently received the leather waste basket-boxed, It is absolutely beautiful and very masculine. It is perfectly tooled in a deep reddish dark leather, fitting in with my library that is decorated with a rock and mineral collection, and bronze and marble statuary. This is the second item from this family that I've purchased (the first is a leather tooled box that I keep next to my chair in the living room). Thank you for sharing your talent, and thank you Novica for providing a fair trade marketplace for such artistry. Such beauty made available in a moral atmosphere--the way life should be. Breakfast in bed is FANTASTICO!!!! !